Arthur, Paul, “Structural Film: Revisions, New Versions, and the Artifact,” pp. 5-13. Bartone, Richard, “Three Films by James Broughton and Joel Singer,” pp. 114-16. Bonet, Eugeni, “There is an Independent Cinema in Spain, But…,” pp. 59-73. Carroll, Noel, “The Cabinet of Dr. Kracauer,” pp. 77-85. 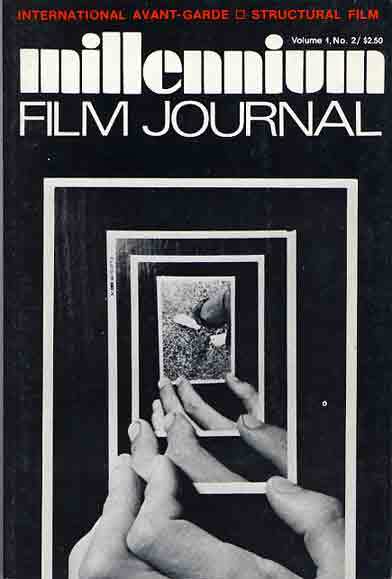 Chin, Daryl, “The Future of an Illusion(ism): Notes on the New Japanese Avant-Garde Film,” pp. 86-94. Cook, Scott, “Peter Campus at the Whitney,” pp. 119-22. English, David, “Films by Paul Winkler,” pp. 117-18. Gidal, Peter, “Talk at Millennium,” pp. 14-22. Hein, Birgit, “The Avant Garde and Politics,” pp. 23-28. Iimura, Taka, “On Film-Installation,” pp. 74-76. Kelly, Keith, “Riddles of the Sphinx: One or Two Things About Her,” pp. 95-100. Le Grice, Malcolm and Peter Gidal, “Letters,” pp. 50-55. Liebman, Stuart, “Apparent Motion and Film Structure: Paul Sharits Shutter Interface,” pp. 101-09. McCall, Anthony and Andrew Tyndall, “Sixteen Working Statements,” pp. 29-37. Noguez, Dominique, “The Experimental Cinema in France,” pp. 56-58. Peterson, Vicki, “Two Films by Chick Strand,” pp. 110-13. Simon, Bill, “‘Reading’ Zorns Lemma,” pp. 38-49.